After twelve-year-old Marco makes some solid investments trading stocks on the internet he profits nearly ten thousand dollars. He comes up with lots of ideas for how to spend the money, like buying a large-screen television or a ski-board. But soon after, a friend asks him to put his mind to helping the brother of a pen-pal who has been wrongfully imprisoned in Italy. Marco, being a bright and resourceful kid, pools the efforts of friends on a world-wide group chat and comes to the rescue. 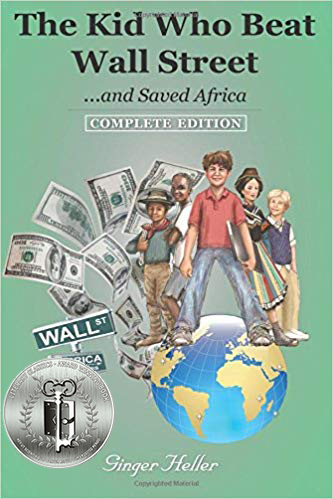 As Marco continues to make more money on the internet, nearly a half million dollars to be specific, he begins to see that people around the world are not as fortunate as him and he learns that helping others can be the greatest reward of all. Author Ginger Heller has penned a captivating book that will thrill and inspire young readers. This multi-faceted book has much to offer young readers who are sure to enjoy this page-turning adventure. 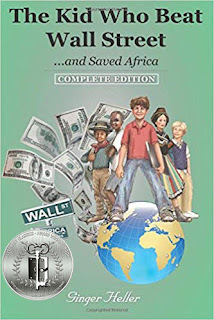 Recommended for home and school libraries, The Kid Who Beat Wall Street and Saved Africa has earned the Literary Classics Seal of Approval.